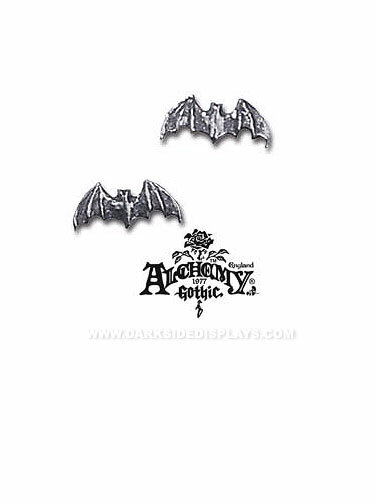 Alchemy Gothic™ Bat Stud Earrings offer discreet aural accents for the nocturnal hunter. These Small bats with open wings earrings have post backs and are handcrafted in pewter by artisans at Alchemy of England. For pierced ears. Bat Stud Earrings measure .5"W. Often sold as singles, we offer these as a pair. Copyright Alchemy Carta Ltd. Alchemy Gothic is a registered Trademark, All Rights Reserved.